Santa Barbara quintet Devildriver have been around since 2002 in once incarnation or another, with frontman and former Coal Chamber vocalist Dez Farfara being the only original member in the current line-up. The groove metal band are one that should be noted as having the rare element of getting heavier with each progressive release, rather than the traditional mellowing out or levelling off in sound that most bands seem to encounter as extremes push out in their dynamics or the band find their signature sound. The decision to do a covers album is always a bold one, to do a covers album on a theme is even bolder. But Dez Farfara is well known for being someone to follow his own path. Renowned Metal producer Steve Evetts (Butcher Babies, The Dilinger Escape Plan, Suicide Silence) sat in the chair for this one, rather than a country producer, perhaps suggesting which way the album was going to go, if it was ever in doubt. After a typically country twang intro guitar part “Country Heroes” kicks in full force with former Superjoint Ritual Hank Williams III bassist doing his finest Ozzy Osborne vocals amid Dez Farfara’s throat shredding uncleans and blast beats from former Chimaira drummer Austin D’Amond. It’s haunting and strangely melodic as well as being a fairly brutal introduction to a full on metal album. “Whiskey River” sees Randy Blythe and Mark Morton of Lamb of God join Devildriver for a Willie Nelson cover and up the heavy significantly. Blythe and Farfara have a vocal contest between themselves as to who can go heavier, while the pedal steele guitar adds a finesse that works incredibly well. Taking on “Outlaw Man” by The Eagles on their own, Austin D’Amond puts in a phenomenal performance on the kit while guitarists Mike Spreitzer and Neal Tiemann both throw in impressive guitar work. “Ghost Riders in the Sky” sees the son of Johnny Cash, John Carter Cash and his wife Ana Cristina Cash joined by Randy Blythe of Lamb of God for the Johnny Cash Cover. Blythe’s dark opening vocal amid the pacey musicianship and thunderous rhythm section is tasteful and the slick production should also be noted. The Cash partnership add a haunting melody to the chorus that sees some impressive vocal layering – Dez Farfara’s guttural uncleans contrasted against the Cash cleans and Blythe’s deep, deep spoken word. 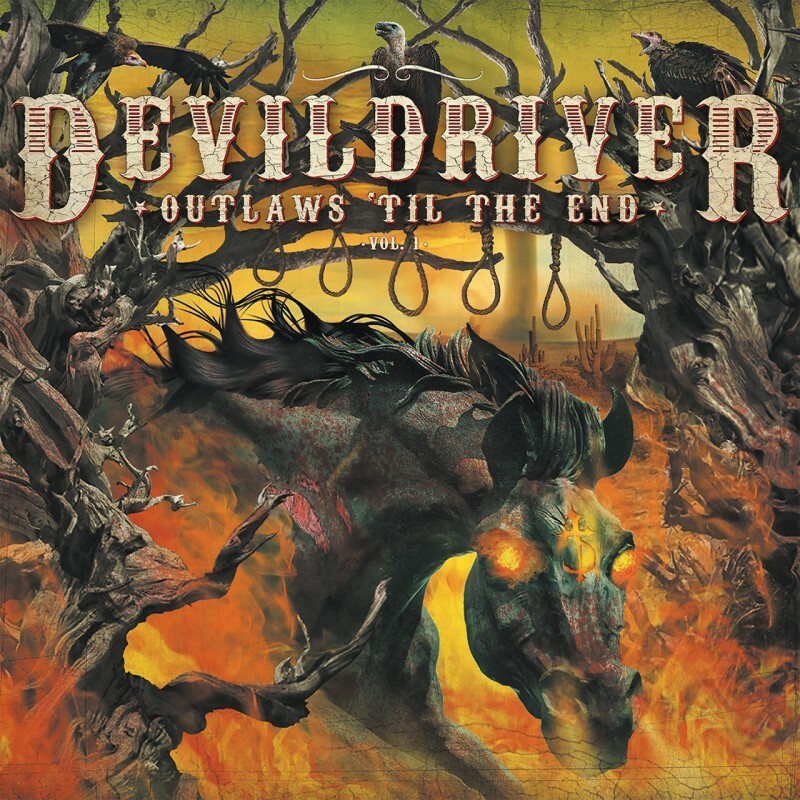 Johnny Paycheck Cover “I’m the Only Hell (Mama Ever Raised)” continues the tales of Whiskey debauchery and hell raising as Devildriver continue to make the Outlaw Country songs their own in every possible way. It’s both brutal and dark while the musicianship continues to impress as everything is played out at 3-4 times the pace amid pounding drums and blast beat sections. George Jones Cover “If Drinking Don’t Kill Me (Her Memory Will)” is as liver threatening as they come and Wednesday 13 (Wednesday 13, Bourbon Crow, Murderdolls) has the perfect horror haunting vocal to contrast against the back drop of crushing guitars and even more crushing throat shredding vocals from Farfara himself. The guests fit the song choices perfectly and each piece of each song slots together like the best of jigsaw puzzles. Part of that is down the the originals being well written classic songs in their own right. Part of that is down to Devildriver taking their time to get the instrumentation perfected to within an inch of its life while doing their own thing with each song – to make them into Metal anthems without taking anything away from them in any way. That’s the secret and an act of genus. Featuring Lee Ving of Fear, “The Man Comes Around” is the second Johnny Cash cover and see’s the legendary Los Angeles Punk add a dark spoken word introduction before the breakneck guitars kick in. The outcome is a hellishly good punk speed anthem. “A Thousand Miles From Nowhere” is perhaps one of the youngest songs on the album, the Dwight Yoakam cover being released in 1993. Slowing down the pace by the tiniest of margins to allow for the clean chorus line underpinned by the uncleans is a nice touch, while the guitar solo work continues to shine like the sun over the desert. The closing acoustic passage adds atmosphere while allowing for a pallet cleansing moment.